Sometimes you do not want to or cannot install another security software on your computer system to scan for malware. Maybe you do not have the rights to install software on the computer or you have a program installed and do not want to risk incompatibilities. 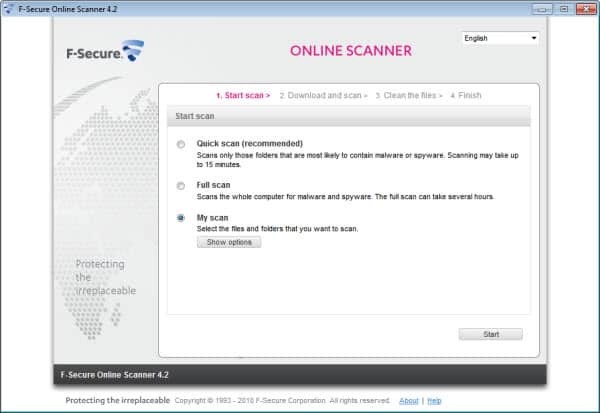 The alternative is an application like F-Secure's Online Scanner which can be started from a web browser. This particular application is a Java app which means that the latest Java Runtime Environment (JRE) needs to be installed on the system. Users can visit the official website to start a scan of their computer system right away. The online application uses up to date virus and threat definitions that F-Secure maintains for all of their products. When you start the online app you are asked to select a scan mode. Available for selection are quick scan, which only scans the most important files and folders of the system, a full scan or a custom scan. Custom scan can be configured on an extra screen in the program interface. Here it is then possible to scan all or only selected folders and file types. The program itself will scan for malware, spyware, rootkits using a database of known virus signatures and heuristics to identify unknown threats. The program then downloads files from the Internet which may take some time depending on the Internet connection. The scan time depends largely on the selected mode and the speed of the system. The application displays a summary after the scan highlighting potentially malicious files. These files can be deleted from the system and send to F-Secure as a sample (handy if heuristics identified an unknown threat that F-Secure has no information about). The program is easy to use and comes with enough customizations for advanced uses. I would not recommend relying solely on online scanners for security though, but would recommend them for additional security scans on a regular basis. You can check out our overview of online virus scanners here.